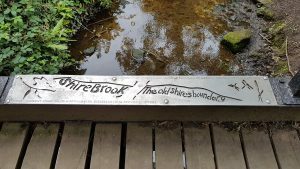 Ride report: 18 riders assembled after a dreary damp Friday afternoon to ride ancient, modern, symbolic and metaphorical boundaries and borders in Sheffield and the weather lifted to bring on a sunny evening and red skies before the full moon shone down us as we cycled over Manor Top into Hurlfield, down into Gleadless and the pub where the beer was the finest, cool, crisp, clear bitter. 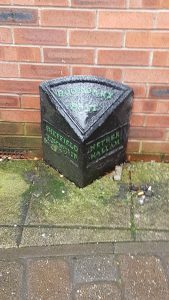 Some fabntastic aspects of the Sheffield landscape – who knew Hackenthorpe could be that attractive? “There are no illegal immigrants, only illegal borders” – Benjamin Zephaniah. Boundaries and borders are a topic of interest at the moment. How do we resolve the Irish border question without reuniting the Emerald Isle? If “we” take back control of our borders, who are we actually giving back control to? The racists at the Home Office who give people who have contributed to our society for 60 years notice to quit? 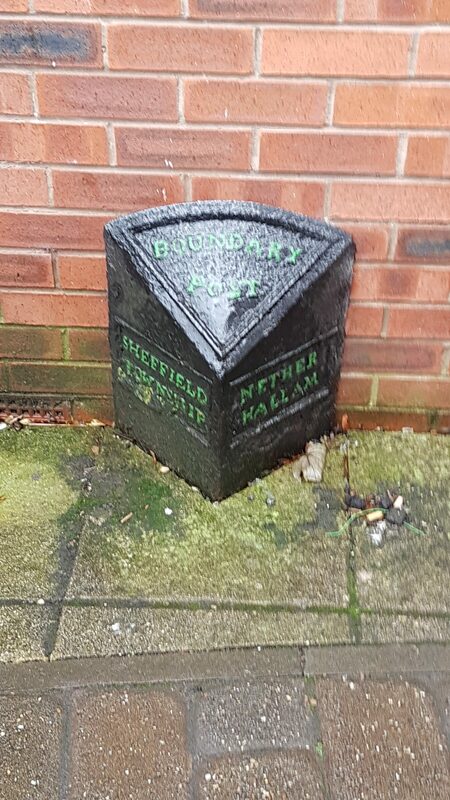 The story of Sheffield’s borders may prove instructive. We are proud to be in Yorkshire but many of us commute into Derbyshire, Nottinghamshire and other places that are accessible via the M1 or George Hudson’s Midland Railway. Equally many people commute into Sheffield from Derbyshire thus benefiting from the city’s prosperity without having to pay the higher council tax rates that pay for the infrastructure without which that prosperity would not be possible. In the 1970’s there was a referendum in Dronfield to decide whether that fair town should stay in Derbyshire or throw its lot in with Sheffield and therefore Yorkshire. Unsurprisingly given the much lower council rates of the time in Derbyshire the town decided to stay where it was. For this reason transport between two remained very poor for several decades – only recently has it become viable to commute by rail from that direction. Throughout history the borders of Sheffield and Yorkshire have shifted. During the British Iron Age the area became the southernmost territory of the Pennine tribe called the Brigantes.The rivers Sheaf and Don may have formed the boundary between the territory of the Brigantes and that of a rival tribe called the Corieltauvi who inhabited a large area of the northeastern Midlands. Then there is the boundary between between Sheffield and Hallam, somewhat nebulous. We will start by visiting the boundary stones between these areas. It was these that got me thinking about about boundaries. Sheffield Midland Station marked out a boundary between the east and west of the city. Initially the Norfolk Park area was a deer park restricted to the aristocracy. Later as it got built up it seemed to act a boundary between the prosperous west and the working-class east of the city. Does the North-South divide pass along the Midland Railway? Then those more modern boundaries the Sheffield and Mosborough Parkways, split up areas and make it difficult for wildlife to roam the green spaces. Then we consider the psychological barriers. Are there parts of the city you wouldn’t visit, possibly not cycle through, because you consider them to be too dangerous? (“no-go” areas) Well we will visit some of those. We will examine the boundaries between the elements – at what point does air become water? And lastly we will experience the boundary between being alive, alert and energised by cycling and being slightly inebriated. Safe journey home!